I truly never thought I would ever enter a triathlon, but my friends I must share with you that last month when we got back from the UK something clicked inside me. A huge weight had been added to my stomach by our trip, but an even huger weight had been lifted from my shoulders, not just from seeing my memories come to life, seeing Dad, saying goodbye properly to Nanny and Grandad, sharing family secrets, having some serious conversations with myself, all that good stuff… But going back to the UK had been something I had been meaning to do for almost 10 years, and I didn’t realise it but it had become a massive mental obstacle. When we got back, I felt free and in complete control of me. Honestly, until last month, I thought that me doing a triathlon was physically impossible. I like pushing my fitness; I get some sick enjoyment from being sweaty, uncomfortable and absolutely knackered. But a triathlon isn’t just uncomfortable! I am a terrible swimmer – the extent of my swimming abilities were acquired in the mandatory school swimming lessons where you learn how to catch urinary tract infections and not drown in your pyjamas (best day of school ever?!) along with playing in water slides and being chucked into small pools by Dad on family holidays. As an adult, I have successfully avoided almost all swimming. My running failures are well documented, in that the most I’ve ever run is a 10km with Willow after which I couldn’t walk for 3 days and other than that I try not to run anything more than 10 metres. Even Grandpa nearly beat me in the 5km run we did together in June. And like many females I steer well clear of bicycles because they are supremely evil to what I will refer to here as our private parts. But suddenly I didn’t believe in impossible, I just believed I wanted to have a go. Cheesy I know! 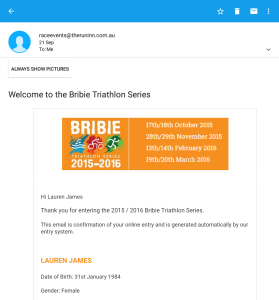 So I googled the closest tri event nearest to me and found the Bribie Triathlon Series, which had races coming up in November or February. November was too soon if I wanted to be sure I would cross the finish line, but when I saw the short course tri was only 300m swim, 10km bike and 3km run, I knew that February was achievable. So I just signed up there and then, no research, no practice, no training, no effing clue to be honest. At first I didn’t think any of this was worthy of sharing with the world. I felt pretty sure no-one would care that I was about to fail miserably at a Triathlon. But then as I started training some hilarity ensued and I think you’ll all enjoy having a good old laugh at my misadventures in training. And frankly, I like telling you all about it. So, welcome to the Blog! Please leave comments below. 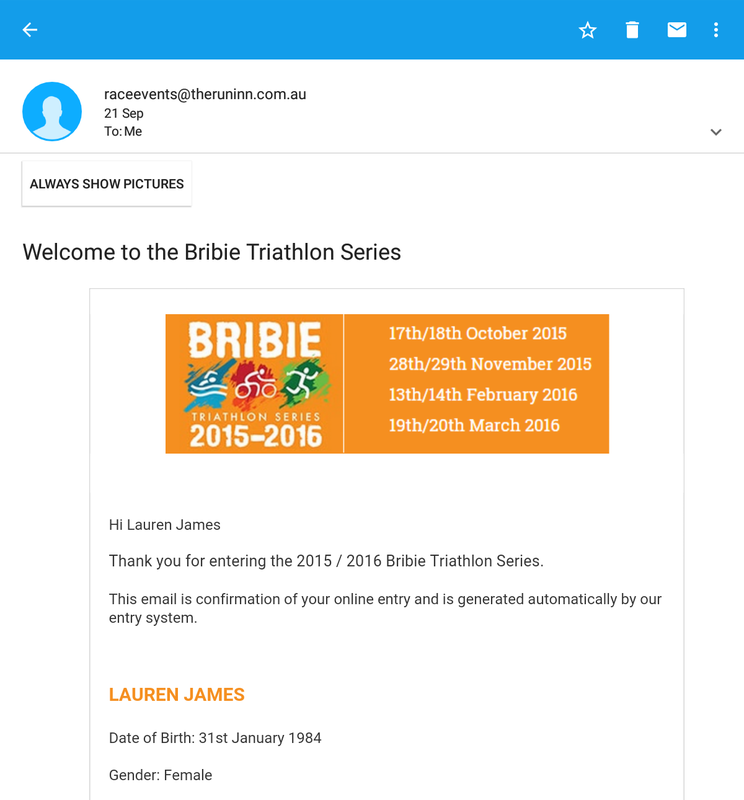 This entry was posted in Everything Else and tagged bribie, newbie, triathlon. Bookmark the permalink.